President Mahinda Rajapaksa and Madam Shiranthi Rajapaksa participated at the Golden Jubilee Anniversary celebrations and a cultural show of the Peoples’ Friendship University, which was held at the university auditorium in Moscow yesterday evening, 7th February. President Rajapaksa is seen here being welcomed at the ceremony by the students of the university and the Vice Chancellor Professor Vladimir M. Philipov. 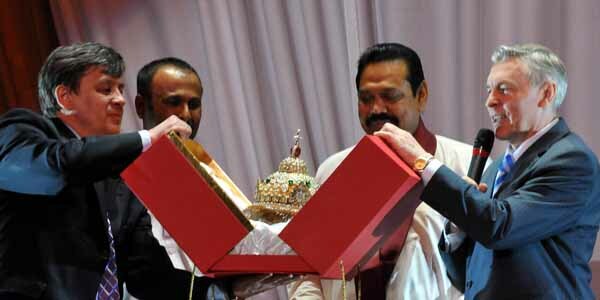 The Sri Lankan President was honoured once again at the cultural show by Prof. Philipov, by presenting a memento, a Russian style gold plated crown, decorated in precious stones. Later the President addressed the gathering and recalled the friendly ties between Sri Lanka and Russia. President Mahinda Rajapaksa and the First Lady also participated in the opening ceremony of the “Rajatha Dekma” photo exhibition which was organised by the President’s official photographer, Mr Sudath Silva in the university premises. Rajatha Dekma displays the photographs of Sudath Silva’s quarter century journey in his profession as an official photographer for four successive presidents of Sri Lanka. President Rajapaksa, who is presently on a tour of Russia, received the Honoris Causa Doctorate from the Peoples’ Friendship University formerly known as Patrice Lumumba University in Moscow on 6th February. He was conferred the Doctorate for his contribution to world peace in defeating terrorism and for his distinguished service to education and development. Among the distinguish guests there were many Sri Lankan students at the function. On his first state visit after being elected to a second term, President Rajapaksa is due to meet with his Russian counterpart Dmitry Medvedev and Prime Minister Vladimir Putin this afternoon. Ministers Rohitha Bogollagama, Anura Priyadarshana Yapa, Susil Premjayantha. Prof. G.L Peiris, Mahindananda Aluthgamage, Mr.Wimal Weerawansa MP, Secretary to the President Mr.Lalith Weeratunga, Sri Lanka Ambassador in Moscow Mr.Udayanga Weerathunga, Director Genaral of the Colombo Hospital Dr.Hector Weerasinghe and the co-ordinator to the President Mr Sajin Vas Gunawardena were present at the occasion.